You’re never too old for braces, though many adults would rather live with crooked and uncomfortable teeth than turn into a metal mouth. But you don’t have to experience the social stigma of noticeable braces. There are several options for adult braces that can subtly give you straight, healthy teeth. Difficulty chewing, speaking, or biting. A few years of orthodontic treatment is a small price to pay for an adulthood free of oral health problems, pain, and discomfort. Invisalign: This revolutionary orthodontic method has increased the number of adults who wear braces exponentially. Invisalign braces use clear aligners to straighten teeth, so no one ever needs to know that you’re undergoing orthodontia. There are no restrictions with Invisalign – you can remove the aligners to eat and drink whatever you want and clean your teeth easily, no special tools needed. Invisalign can usually correct the same problems as traditional metal braces. Ceramic Braces: If your alignment issue is complex and Invisalign is not the best option, you can still alter your bite and straighten your teeth in a hard-to-notice way. Ceramic braces aren’t invisible, but they are discreet. Instead of metal brackets, ceramic braces are applied using clear or tooth-colored brackets and wires. This orthodontic method is efficient and effective. Lingual Braces: For adults who want the benefits of metal braces without the appearance of them, there are lingual braces. In this method, brackets and wires are attached to the back of the teeth, though the option is sometimes considered uncomfortable and adjustments can be more time-consuming. Conventional Metal Braces: Ultimately, conventional metal braces get the job done well and done quickly. 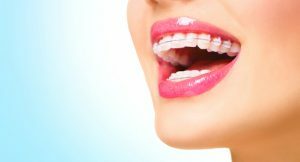 You may cringe at the idea of what you could look like wearing metal braces, but modern metal braces are far less obvious, and the overall treatment time is often faster than with other adult braces. Along with aligning your bite, jaw, and teeth, adult braces have fringe benefits that you may not have considered. When your teeth are straight, they are easier to clean, so your teeth and gums, with proper care, will be healthier after braces. Getting in all the nooks and crannies with dental floss and a toothbrush is challenging enough – teeth that aren’t in the right position leave you susceptible to a build-up of plaque and food, which is more likely to lead to decay, infection, or gum disease. Straight teeth mean that all teeth are working as they’re meant to, as well as your jaw, so there is no overcompensation or uneven wearing of the enamel. By correcting the bite, problems like teeth grinding, jaw clenching, and TMJ disorder can be relieved, eliminating pain and discomfort and protecting you from cracked or broken teeth. And, of course, there is the obvious benefit of having a straight smile that you’re proud of. Our smiles are incredibly important – they are the focal point of our face and can impact how we are perceived. If your teeth are straight and flawless, you will seem smarter and healthier. Career can improve and social life too when you get a confidence boost from straight teeth. Are You Ready to Talk About Adult Braces? Special consideration must be taken when giving adults orthodontic treatment. Adult teeth do not move as quickly or as easily as a teenager’s teeth. There is likely to be discomfort at the beginning of treatment, but it is temporary, and any pain means the orthodontic treatment is working properly. Find out what orthodontic treatment is right for you, including whether you are a viable candidate for Invisalign braces. Adult braces have never been more convenient or affordable. Straight teeth not only improve your appearance, they can improve your life. Schedule your consultation with Dr. Roberts or Dr. De Marsche in their Center City, Philadelphia, or Lawrenceville, NJ, orthodontics office.